Art and interactive installations, springtime activities and unique living spaces. 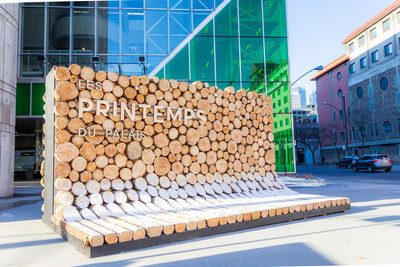 MONTRÉAL, April 8, 2019 /CNW Telbec/ - The Palais des congrès de Montréal is proud to unveil its lineup for the very first edition of "Les Printemps du Palais." Starting April 8, Montréalers are being invited to rediscover their city's iconic convention centre. 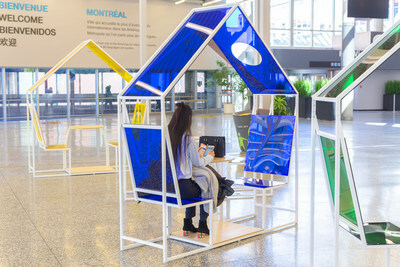 In the spirit of replicating the beat of the Montréal community, the Palais is presenting art- and design-driven experiences by local creatives that will showcase their work to the 850,000 people who visit the convention centre to attend one of the 350 events it hosts each year. The lineup spans pop-up works, interactive installations and public living spaces, offered against the backdrop of typically springtime activities for young and old alike. Jointly produced with MASSIVart, this initiative falls within the new vision of the new President and CEO of the Palais des congrès de Montréal, Robert Mercure, which is that of advocating for Montréal creativity and creating unforgettable experiences! "With Les Printemps du Palais, we are inviting Montréalers to discover their Palais and enjoy some unforgettable experiences," declared an enthusiastic Mr. Mercure. "This initiative speaks to the new vision of the Palais and will enable us to stand out from the world's other convention centres by focusing on one of the city's major assets: its community of bold creatives," he added. "Art and design play a key role in the transformation of public spaces. Thanks to the lineup we've assembled for Les Printemps du Palais, both local and international visitors will have the opportunity to experience moments that are typically Montréal, and that reflect the city's creative energy. There's been a shift in how business is done today, and by bringing art and culture into the mix, the Palais is rising above its competitors in the field. We are very pleased to help Robert Mercure and his team realize their new vision for this Montréal landmark" indicated Philippe Demers, CEO of MASSIVart. 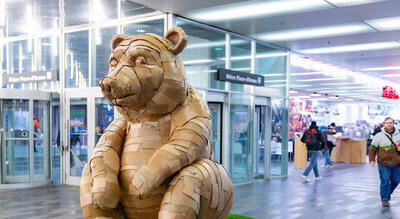 In this tip of the hat to Québec wildlife, Laurence Vallières, a Montréal artist known for her super-sized sculptures made of salvaged cardboard, offers us an immense bear sculpture made of recycled cardboard. The bear greets visitors, and captures their imagination. The artist, who has made Montréal her home. admits wanting her art to shock, amuse and inspire. Montréal artist Whatisadam, aka WIA, turns the classic can of Québec maple syrup into an iconic tribute to local culture. 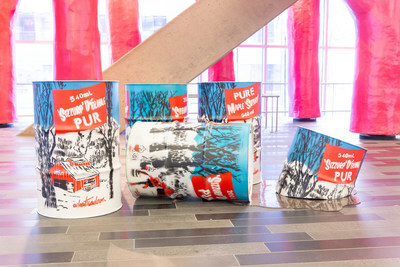 The eight massive garbage cans that make up the installation are playfully arranged at the edge of Claude Cormier's Lipstick Forest, known for its pink trees, not the sap-producing kind needed to make syrup. The illuminated structure by the design workshop EN TEMPS ET LIEU greets visitors as they approach the Palais and captures their imagination before even entering the venue. A mix of raw materials, conventional techniques and modern technology, the installation invites us to gather around the cultural cues that provide the tempo for our winters and signal that spring is around the corner. Although a temporary art installation, the materials used will be repurposed and serve as a tribute to the province's raw materials. Come enjoy maple taffy on a fresh bed of snow, just like at the sugar shack! Until April 13, we will be serving 350 maple taffies on a stick each day for free to people visiting the Palais. After we reach our daily limit, it'll be $2 a stick. Wednesdays to Fridays from 11 a.m. to 8 p.m., and weekends from 11 a.m. to 5 p.m.
Lace up those running shoes because now that spring is here, the Palais and Cardio Plein air will help you get back in shape with workouts that will stretch the length of the convention centre, and give you a chance to see it anew. Two types of workouts available for free. A total of eight 45-minute workout sessions at lunchtime for groups limited to 35 people. Hurry and book your spot. See here for more details. The NFB and Tourisme Montréal will take over the Palais's screens with a series of short films and videos that will bring their unique perspective to the city's attractions and Québec culture. International visitors will get a glimpse of the wonders the city has in store for them, while Montréalers will have the opportunity to see their city from a different angle. SETTING THE STAGE FOR DESIGN! Aire Commune, the team behind the popular Mile End outdoor coworking space, now brings you Îlot vert, an innovatively designed area meant for swapping ideas and working collaboratively. Have a big client meeting or planning a brainstorming session with the team? 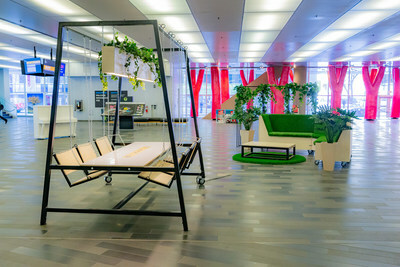 This productivity oasis has everything you need, including a custom made swing table with power outlets and a lounge area! Inviting the public to take a moment to kick back and spend some quality time in good company – that's what this furniture is tasked with. Designed by Machine, who are also the brains behind the Palais' new lounge area, each small coloured compartment can be easily moved and reconfigured within this vast space to create relaxing meeting areas for groups or a chillout pod for one. 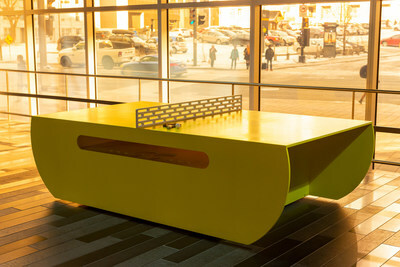 Come challenge your friends and colleagues to some ping-pong on these glowing yellow tables that'll make you feel like a kid again! These extra touches custom created by Labodeco will be sure to add some bounce to coffee breaks. 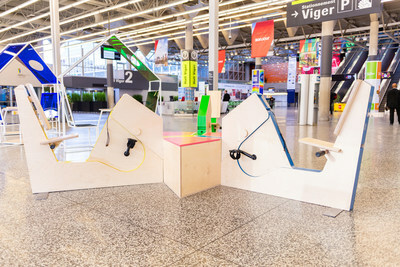 Work out while making sure your phone never dies, thanks to pedal-powered charging stations designed by the Montréal firm DIX au carré that will replenish your mobile devices' batteries! 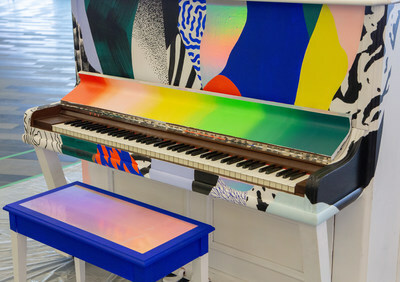 Whether for listening to fellow passing musicians or displaying your own musical talent, you'll strike the right note with the public pianos of the Palais. Personalized by local artists, such as La Charbonne, Cyndie Belhumeur and Maylee Keo, they will definitely add ambiance to our venue. Montréal is a city of knowledge and the Palais, a trading floor of ideas and discoveries. 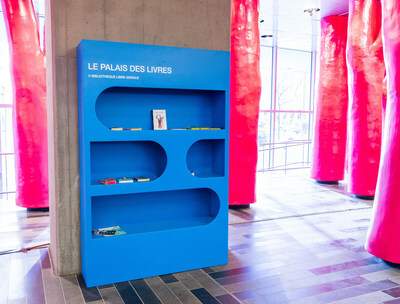 Based on the tried-and-true system of bringing in a book and swapping it for another, our two self-serve libraries tailor built for the Palais by Labodeco will reflect the reading pleasures of visitors from all over the world. Recipient of the highest quality standards certification in the industry, the Palais des congrès de Montréal attracts and hosts conventions, exhibitions, conferences, meetings and other events. Buoyed by a team of creative professionals with one of the highest customer satisfaction rates in the world, it generates major tourism revenues and intellectual wealth for Montréal and Québec, while also contributing to the international reputation of Montréal, the top host city in the Americas for international events. To learn more, visit congresmtl.com. MASSIVart is a global art-driven consulting agency that produces extraordinary experiences and spaces using the transformative power of creativity. Connecting artists and opportunities for collaboration and public consumption, MASSIVart works closely with emerging and established creators along with leading art institutions, developers, architects, commercial venues and consumer brands to deliver exclusive content, stimulation, connectivity, and engagement through art. Collectively, MASSIVart aims to create memorable moments and environments worldwide that are infused with immersive events, captivating installations and compelling art collections to leave a lasting impression. For more information please visit www.massivart.com.